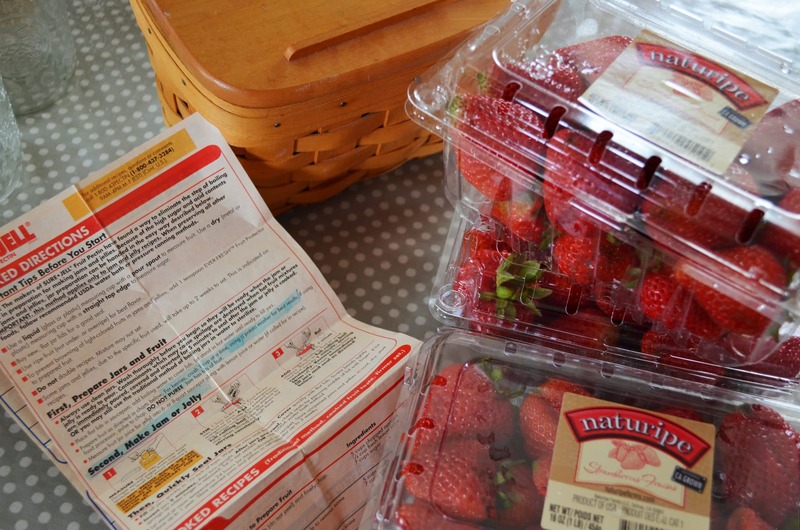 A week ago on Saturday my husband brought home 16 quarts of strawberries. They had to reside in coolers because the fridge was too full. Then on Sunday my hubby was gone most of the day. After taking our girls to church by myself, taking them out to lunch, and then watching a movie with them I decided I might as well get my jam made. 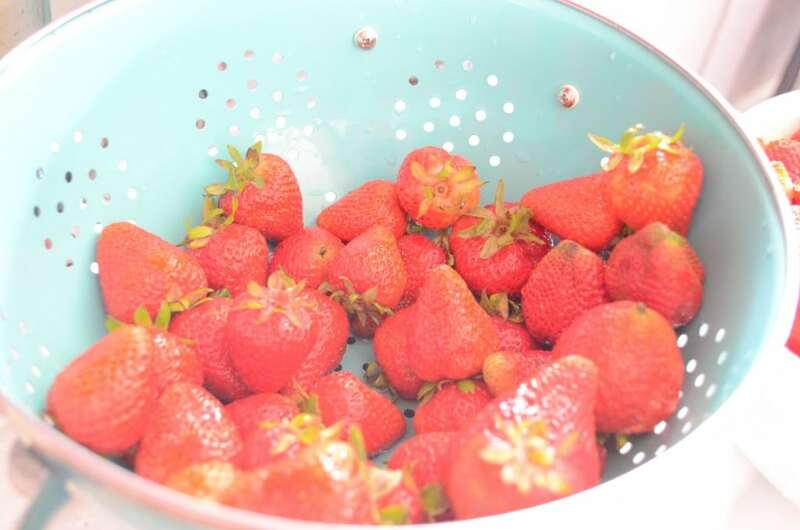 My girls will probably grow up thinking this is what strawberries are supposed to look like on the inside and if they see one that has been on the plant long enough to be red all the way through they will think it is rotten!! When I was a kid we had a bunch of strawberry freezer jam that got sugary. I didn’t really care for it that way and therefore decided I didn’t like strawberry jam. Then I had my Aunt Donna’s jam. She made the cooked jam that you were supposed to seal in jars but instead of sealing it she froze it. It was the best jam I’d ever had. So I asked for the recipe. 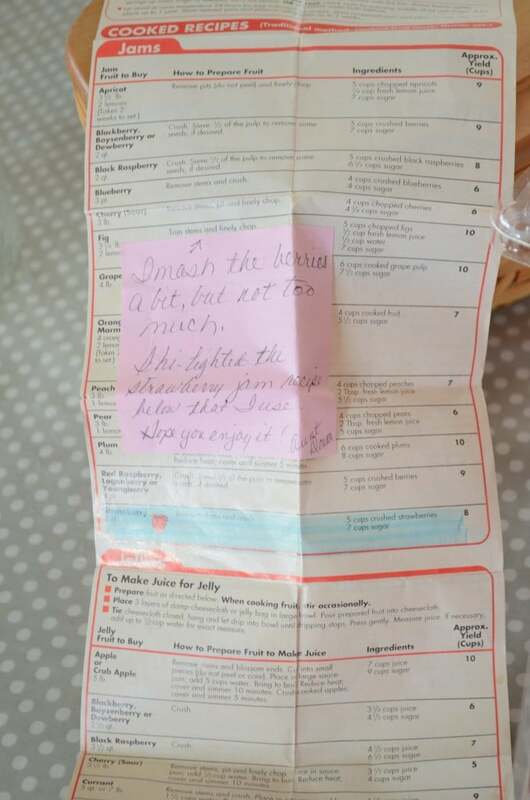 The recipe she used was in the Sure-jell box. She highlighted the parts she used and stuck a note in with it explaining some stuff. I’ve kept it for years. And I’m so glad I did. 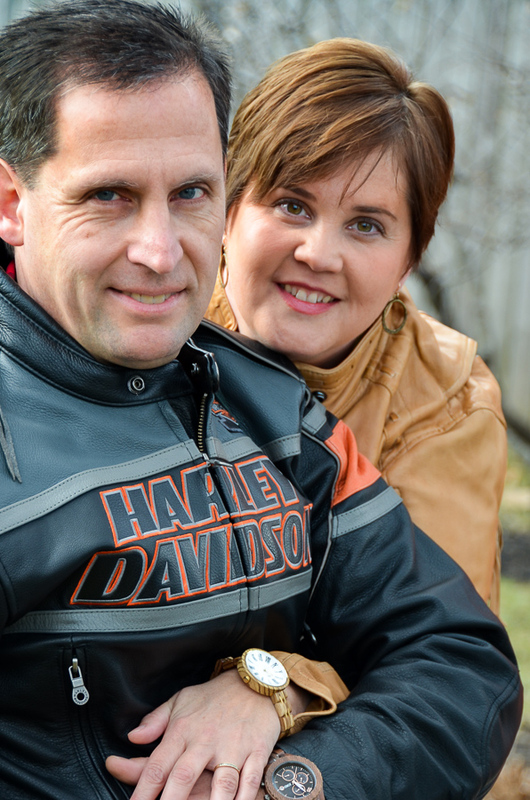 For one – Aunt Donna died of cancer just a few years after Travis and I were married. 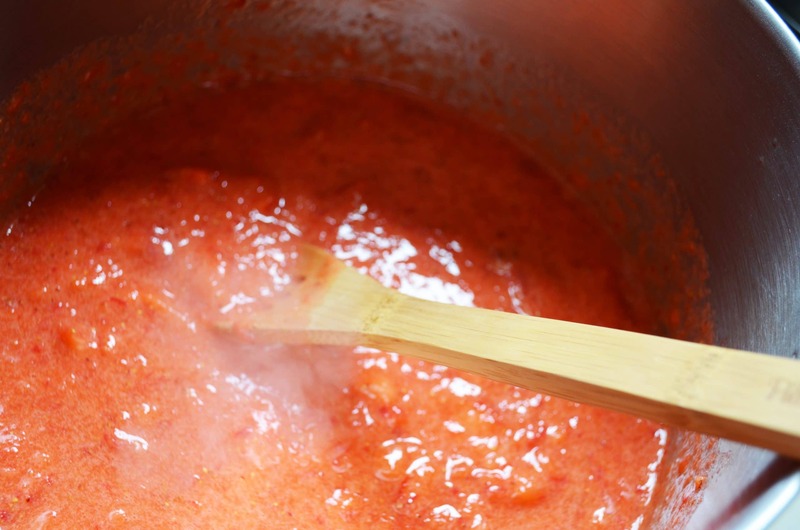 Second – the Sure-jell today doesn’t have the exact same recipe in it. 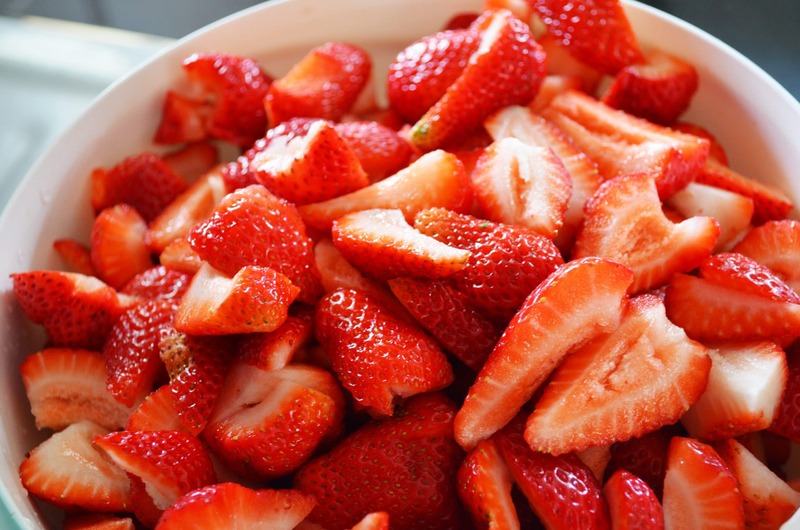 Start with 5 cups crushed berries. 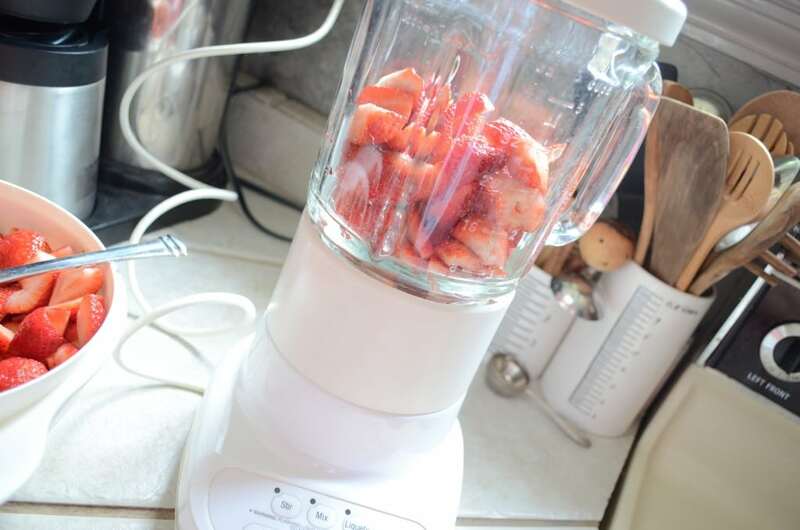 I used my blender this year since the berries were firm and because my girls don’t like big chunks of berries in their jam. 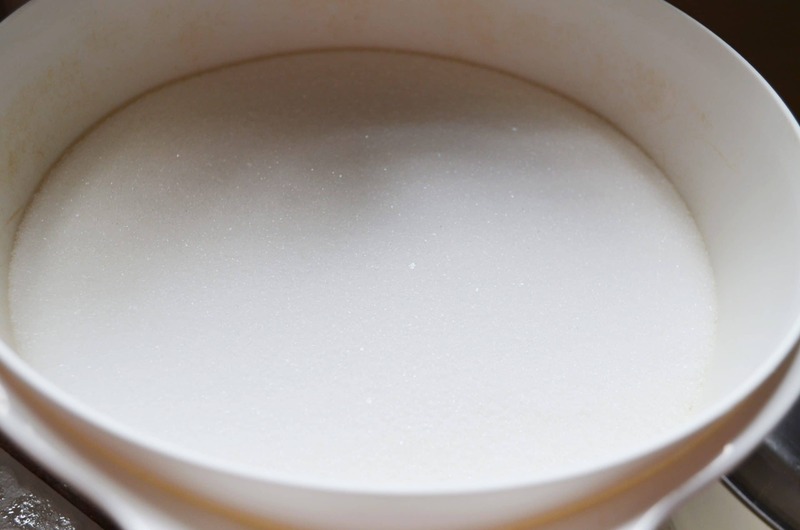 You will need 7 cups of sugar measured out in a bowl ready for the jam when it comes to a boil. Cook on high heat, stirring constantly(except for the time it takes to snap a pic) till mixture boils. Immediately add sugar. 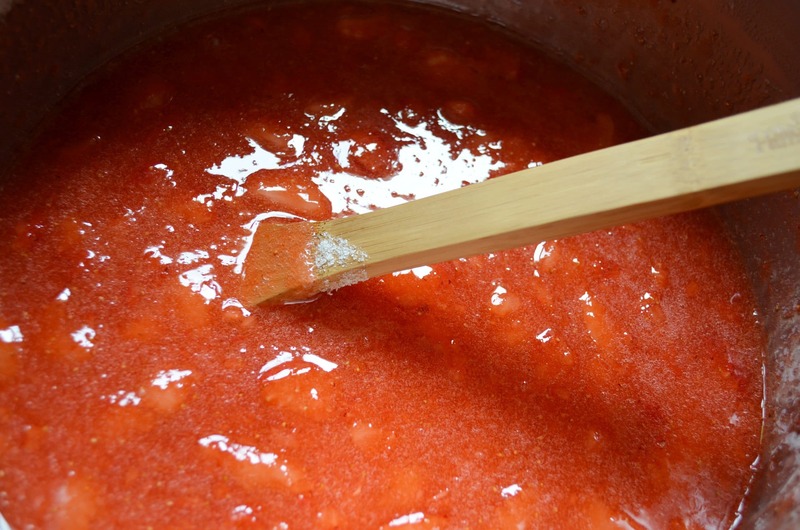 Continue to stir jam till it comes back to a boil. Boil one minute; remove from heat. 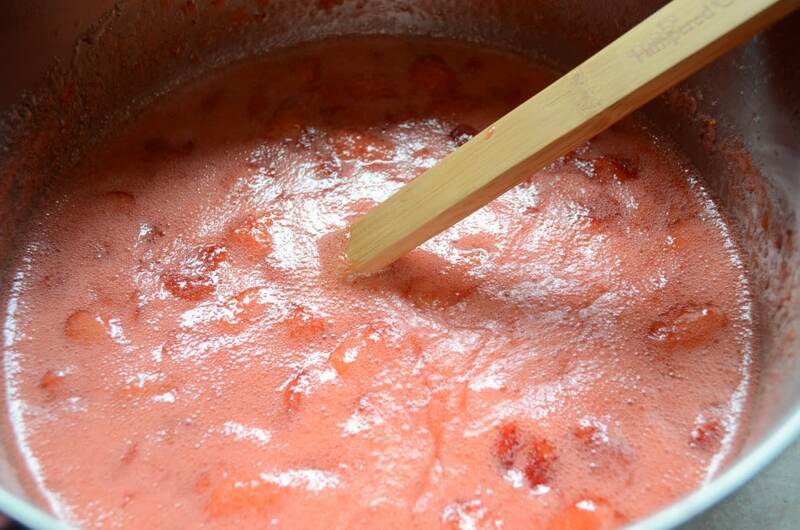 Skim foam off the top of cooked jam. (cooled foam is good on toast!) 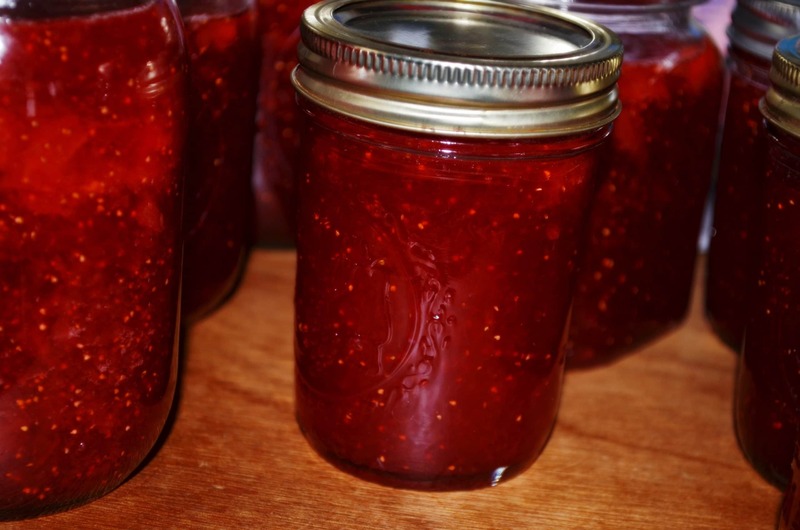 Ladle jam into pint jars or 1/2 pint jam jars. I usually get about 5 pints per batch of jam. This year I made 3 batches = 15 pints of strawberry jam. It took me 2 hours to clean, stem, blend, cook, jar, and cleaned up. 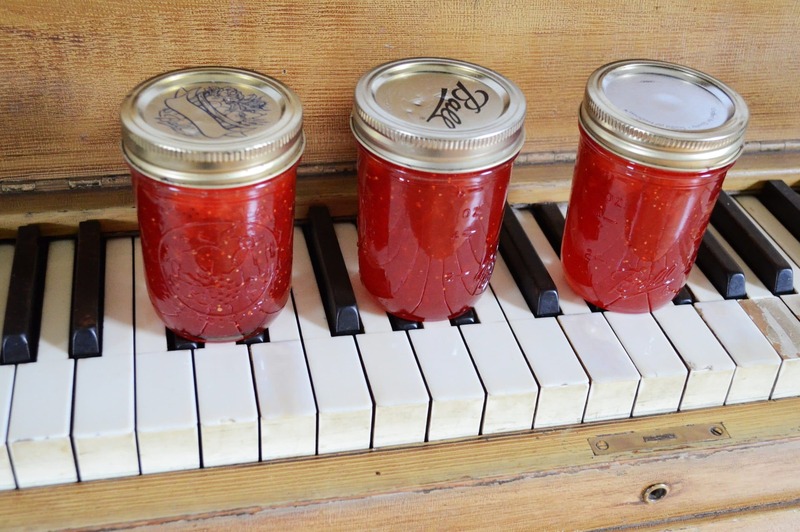 My Teenager thought I was crazy using the piano as a prop for strawberry jam but I liked the way it looked. 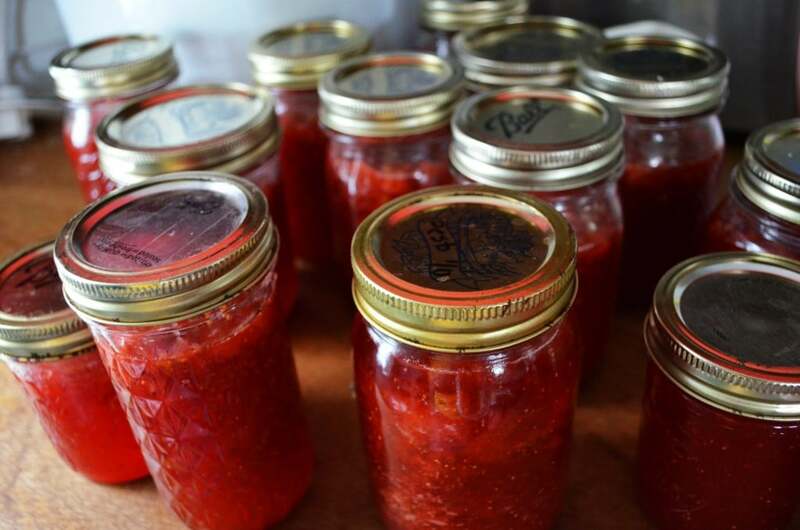 Do you have a favorite family recipe for Strawberry Jam? linking up with these blogs! What do teenagers know? 🙂 I love your creative touch and the jam looks so good, I may have to try making it! The only thing I’ve ever canned is pickled beets, makes my mouth water thinking about them! I need to copy that recipe! I just go by what’s in the Sure-Jell box! I like the look of the jars of jam on the piano keys! i’m making rhubarb currant jam today!! i don’t particularly love canning, but my husband has a huge garden and we end up with loads of food!!! i do love the look of freshly canned jam all sitting in a row on a towel in the kitchen. just makes me happy!!! I am a piano teacher living in Sacramento, CA and am putting together a collection of music for my students called Piano Jams (play-on-words). 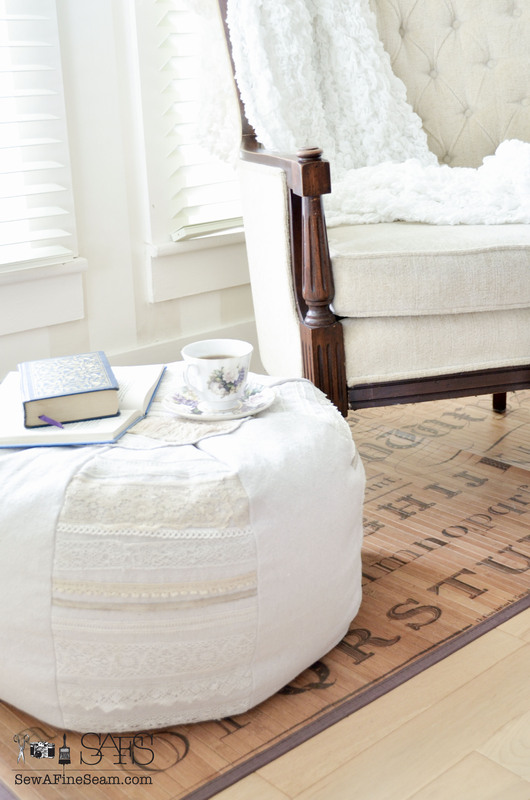 I have been looking for a photo that would tie together this concept, and really like the one I saw on this blog. 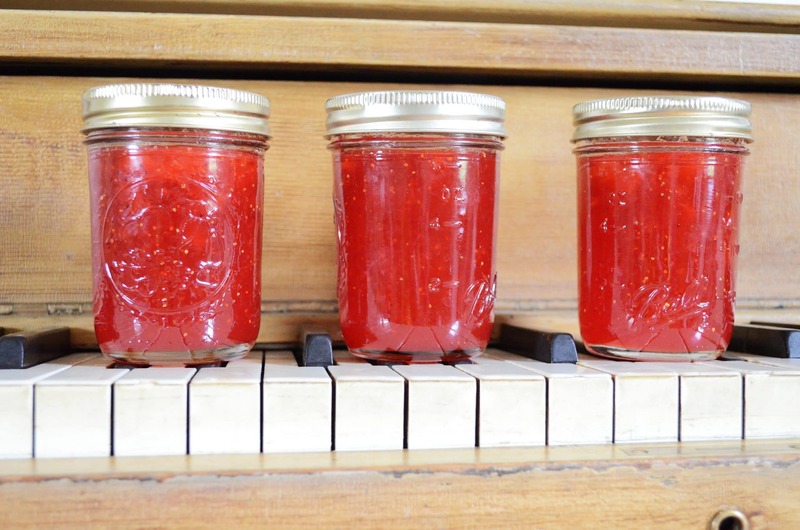 I am wondering if I could use your photo of three jars of jam on the piano as artwork for the cover of this piano music collection? Distribution would be local (e-mailing the song collection to students and friends) I’d be willing to pay up to $35 for use of this photo.